Written on October 5, 2015 . Posted in Announcements + Updates, Writing Center. Artists and designers today are also writing—more often and in more forums than ever before. In this half-day symposium, three editors of artists’ and designers’ writings and three artists and designers who are also writers offer history, theory, readings, reflection, and speculation around distinct forms of dual practice. 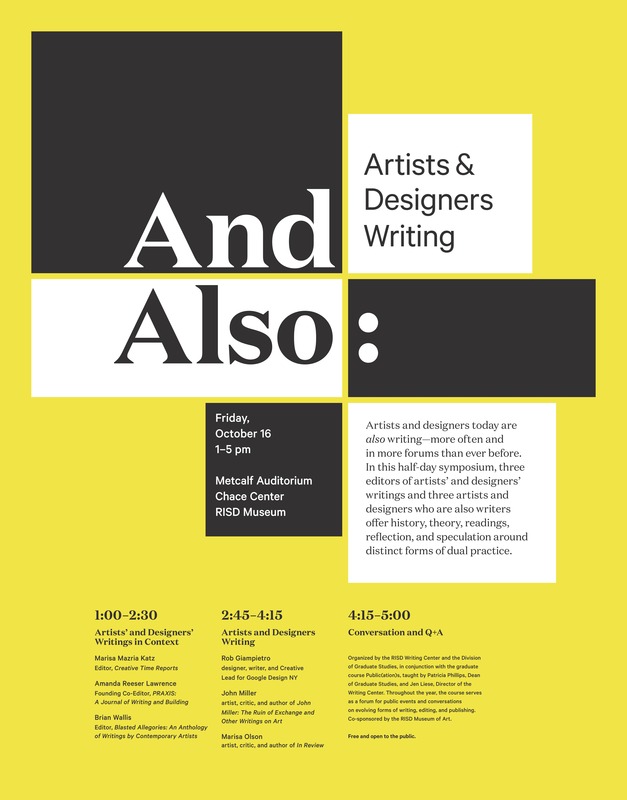 Organized by the RISD Writing Center and the Division of Graduate Studies, in conjunction with the graduate course Public(ation)s, taught by Patricia Phillips, Dean of Graduate Studies, and Jen Liese, Director of the Writing Center. Throughout the year, the course serves as a forum for public events and conversations on evolving forms of writing, editing, and publishing. Co-sponsored by the RISD Museum of Art.